← All I want for Christmas is. . .
SHE can’t read, but after last week’s column about Bonnie being a tomboy, our daughter seems to have gone into girly over-drive. After spending hours clip-clopping around in an older friend’s plastic ‘princess’ shoes and the inevitable screaming ab-dabs when she had to give them back, we took her to the toy shop so she could buy a pair of her own. So far, so pink. I’ve not really ever had need to venture into the oh-so-pinky-pink aisles of toys for girls. Even Bonnie seemed a little surprised by the utter pinkness of it all. We passed the dressing-up outfits for girls. Very disappointing. While boys have the choice of superheroes, TV and book characters, soldiers, doctors, cowboys, indians, the emergency services, dinosaurs and dragons, the girls get, well, you can see from the photo. Female stereotypes. 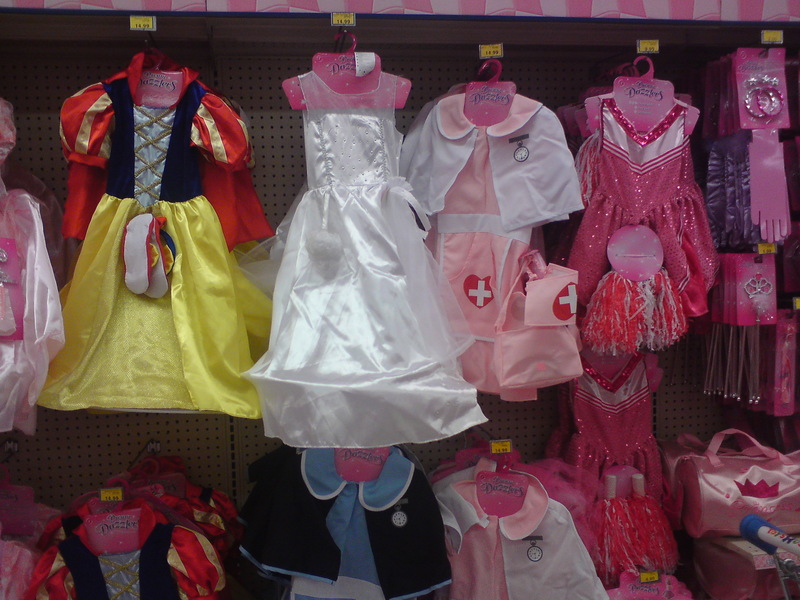 The rack had the vast choice of fairy, Snow White, a nurse, a cheerleader, or a bride. Yes, a bride. Aged 3-4. Eurgh. Hasn’t feminism come a long way, eh, if this is what we offer our daughters for role play?